Concealed Carry Matters: The Spare Magazine | Eagle Gun Range Inc.
Those of us who choose to carry a concealed pistol daily are confronted by still more choices related to that first one. Among them is the choice of whether or not to carry a spare magazine. If you choose to, then there’s the choice of how and where to carry it. Then there’s the matter of being competent to get to and utilize it effectively when needed. These are important and consequential issues that deserve examination. These issues are no less consequential for those who carry a revolver, but this article will deal specifically with pistol magazines. Why Carry a Spare Magazine (or Two)? Arming yourself daily is the first consequential step toward being able to prevail against violent threats. With those six to sixteen rounds in your pistol you’ll have that many chances to save your life or the lives of others, should circumstances become life threatening. It’s possible, perhaps even likely, that your pistol’s capacity alone is enough when you need it. Carrying a concealed defensive weapon, though, has nothing at all to do with what is likely to happen. Rather, carrying daily is a habit built entirely around the notion of what is highly unlikely to ever happen. It’s a responsible and disciplined response to a moral absolute: the preservation of innocent life. So with regard to carrying a concealed pistol, preparing only for high likelihoods and ignoring the “what ifs” isn’t exactly responsible preparation. What if I and/or my family are set upon by several assailants instead of just one? What if the stress or terror of the situation affects my accuracy and my gun runs dry before the threat is stopped? What if my pistol malfunctions and I have to drop my magazine to clear it? What if I accidentally eject my full magazine before the threat is stopped? What if the magazine in my pistol breaks while I’m defending myself? All of these “what ifs” happen to people. Believing none of them will happen to you is, well…wishful thinking (that’s the polite way to put it). But so as not to dwell too much on it here, I’ll simply suggest that carrying a spare magazine or two is a responsible thing to do. If you choose to adopt that responsibility, you’re then presented with the choice of how and where to carry it and, if the need arises, how to competently get to it and reload. There are a few conventional ways and probably dozens of unconventional ways to carry a spare magazine. When deciding how best for you to carry a spare you’ll have to take several factors into account. Your typical day’s dress habit, however, is likely the most consequential factor. There are a host of different options for carrying a spare magazine in a dedicated magazine pouch; both inside the waistband and out. Typical materials are Kydex, plastic, and leather. If you choose a Kydex carrier, be sure it is form fitted to your specific model of magazine (I do not recommend the plain, straight-sided-interior plastic carriers for EDC). There is no better way than a belt pouch to carry a spare magazine in order to access it quickly and surely. If you wear your shirt un-tucked occasionally or as a matter of course for your everyday carry, it makes a lot of sense to use an outside-the-waistband magazine pouch on your weak-side belt. This makes accessing your spare magazine easier than accessing your pistol and it conceals easily under your shirt. Most OWB carriers are vertical, but there are a few made for horizontal carry (lays along the belt), though these may not conceal as well. For more or easier concealment, an IWB mag carrier can be effective, though inside-the-waistband carry is significantly less comfortable than OWB carry. Carrying a spare magazine in a pocket is an easy and adaptable way to ensure you’re better prepared. It doesn’t require an accessory or that you wear your shirt un-tucked. There are drawbacks to pocket carry, but there’s probably no easier, cost-free way to carry that extra magazine. 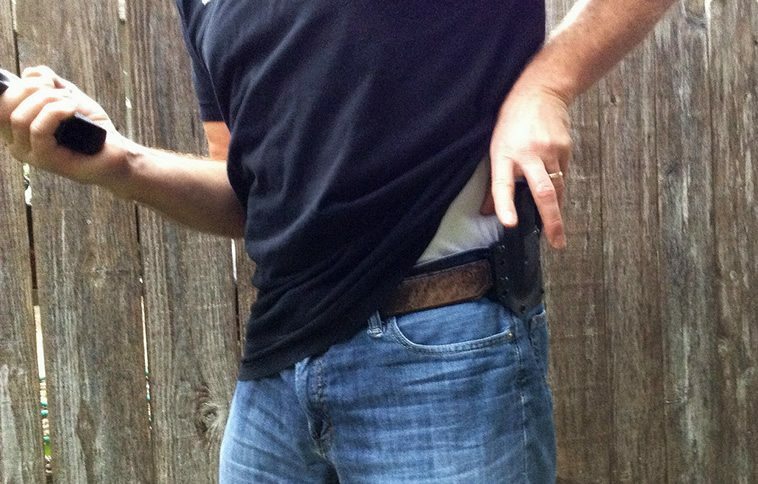 Concealment depends on several factors, one being just how tightly fitted your pants are. The clear outline of a pistol magazine in tight or thin-material pants may occasionally raise eyebrows or prompt awkward questions from friends or colleagues. Have a plan and choose according to context. Getting to you magazine in a pocket can be a little tricky sometimes, but I find that with practice (in all the types of clothes you wear) it can be acceptably managed. As with most things training is the key and must not be overlooked. More on that later. If you carry in your pocket, the best place is your front, weak-side pocket. It is probably best that the magazine be the only thing in that pocket, so if your EDC otherwise fills up that pocket, perhaps choose an alternate location and method. In any event, if you carry this way be sure to train to get to your pocket magazine proficiently and learn the details and best technique for magazine exchanges from a pocket. I must advise readers to avoid the pocket carrier clips, such as the Snagmag or similar products. In my experience, these gadgets only bring problems without solving any. Most importantly, they turn getting to and properly manipulating your spare magazine in a time of crisis into a fine-motor-skill operation, as they only facilitate you grabbing the magazine with your fingertips instead of your fingers and hand. That can be deadly, as one should only train to use and count on using gross motor skills in a life-or-death situation. In my experience, getting the magazine cleanly out of the pocket carrier device only works ~20% of the time. In most cases, the whole thing—magazine and carrier—comes out and you’re left having to separate the two with one hand while trying to reload. Not good! Somewhat less importantly, they tend to expose the top of your magazine at the edge of your pocket, which invites needless questions from people who can see it. In short, I recommend no one ever use one of these devices. It might seem that a purse, bag, or backpack is the easiest, best way to carry extra ammo: it conceals completely and doesn’t encumber or change your clothing. In fact, this method is probably the worst. Off-body carry of a firearm or ammo, no matter the method or location, is always the worst method to employ. If it’s not on your person, your spare magazine can be dropped, taken from you, or even accidentally forgotten somewhere. Moreover, getting to your spare magazine will take seconds longer when you have to get to and sort through your bag to find your magazine, which will not likely be properly oriented for easy insertion into your pistol. If due to other restrictions pack or purse carry is your only option, it is certainly better than not carrying a spare at all. I recommend that you not make it a primary option without thorough consideration. There are a few fancy classifications of reloads, but only two you’re likely to employ in a life-threatening situation: the emergency reload and the tactical reload. Each is contextual to a specific sort of situation. The emergency reload is required when your gun is empty and needs a fresh magazine. The fact that you’ve run your gun empty implies that the situation is complex, chaotic, and/or somewhat overwhelming. It may mean that there are multiple assailants. Therefore, your reload is probably best accomplished behind hard cover (safe from return fire) or while on the move (evading incoming fire). Keep your eyes on the threat and/or the environment so that you can react if you need to; DO NOT look at your gun or magazines during this operation (requires training). 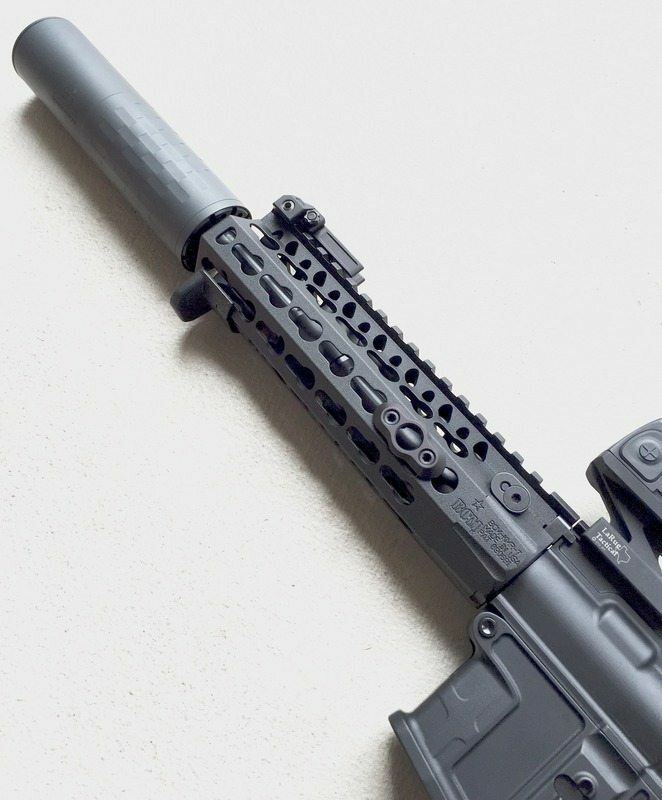 When you seat your replacement magazine, move your hand up to the top of your slide, grab strongly with your whole hand, and firmly rack it to chamber a round—do not get into the habit of using any sort of slide-release lever (more on this later). A tactical reload is used to top-off your gun’s round capacity when an opportunity presents itself after you’ve fired a few shots, but probably still have rounds in the current magazine. DO NOT perform a tactical reload unless you are certain the threat is neutralized. In other words, thoroughly scan the area for threats before you perform a tactical reload. DO NOT eject your current magazine until you’ve retrieved your full spare. The last thing you need is to have an empty gun when a new threat suddenly presents itself. Since your pistol has not run dry, you won’t need to rack the slide after exchanging magazines. Wait! Before you can develop skill in exchanging magazines to reload according to context, you have to be able to competently and effectively get to and deploy your spare. It is important to note that getting to and deploying your concealed spare magazine almost certainly requires that you manipulate your clothing somewhat; just like getting to and deploying a concealed pistol does. Practically, this means you must be intimately familiar with and practiced at doing so with all of the types of clothing you wear. So before you train to deftly exchange magazines like a competition pro, train to get to and deploy your spare magazine from its concealed location. Luckily, you can do this at home and without having to have or hold a firearm. Learn what’s hard, what’s easy, and all of what can happen as you go for your and bring out your spare…while wearing all of the types of clothing you may wear while carrying concealed. Which shirts are difficult or easy to clear as you go for your spare? Which shirts tend to find their way back into your hand as you grip your spare (shirt and all)? (If you pocket carry): which pants have easy-access pockets and which ones have pockets that are a bear to get a hand into or out of while holding a magazine? (If you pocket carry): which pockets keep your magazine properly oriented and which ones allow the magazine to turn backward or upside down during the day? Only through exhaustive trial and error can you discover these vital things about your wardrobe’s impact on lifesaving actions and technique. Work to develop technical skill and muscle memory with these drills for both the practical range and the more conservative indoor lane-style range. Remember that it is best if you train in the clothing you wear every day while carrying concealed. Drills for the practical range: performed with concealed pistol and concealed spare mag. carefully re-holster and re-conceal your (still-loaded) pistol. Since your spare mag had 2 rounds, your pistol now has one round chambered and an empty magazine (don’t make a habit of re-holstering an empty gun). Pick up your dropped mag and load 2 rounds into it and you’re ready to go; repeat ad infinitum. Drill for indoor or lane-style range: performed from the bench. These drills assume you’re relegated to a narrow, walled shooting lane and cannot draw from a holster or use rapid fire. Move to one side margin of your lane, press out and fire one shot (slide locks back gun empty). Go for and grab your spare magazine, drop empty mag (on the bench, maybe), and reload & rack the slide. Eject empty magazine and place both mag and opened pistol on the bench. Note: You’re in a narrow, walled lane so your effort to move off the X will be minimal, but always do it by moving from one side of your lane to the other. Don’t practice the habit of reloading and re-engaging while standing still. Note also that because of the introduced angles, shooting from the margins of your lane at a target that is 7 or fewer yards away may put your rounds on the paper of shooters in adjacent lanes! Take care and courteous of nearby shooters whose targets are farther away than yours. Carrying a concealed pistol is one answer to the “what if” of things that will probably never happen. Carrying a concealed spare magazine allows you to address even more “what if” scenarios. It’s not for everyone, but if it is something you decide to do be sure that you are prepared to effectively utilize your responsible EDC preparation with a clear plan for carrying and concealment, and with practiced skill at deployment. About The AuthorAndy Rutledge is a design professional, competitive shooter and avid road cyclist. He trains at Eagle Gun Range and elsewhere a few days a week to hone his shooting and defensive skills. Great article that someone meticulously took the time to post with great knowledge. Alas, there will always be someone to comment just to be contrary. Excellent article.